Did you catch the Grammys last night? Was I the only one that thought Katy Perry slightly resembled a Dragonfly?! (Phys.org) —Will the extremely cold weather Texas experienced recently have any effect on insect populations this spring? Probably not, said Erfan Vafaie, Texas A&M AgriLife Extension Service integrated pest management specialist at Overton. “It depends upon the insect,” said Vafaie. 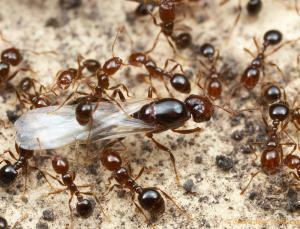 Red imported fire ants, for example, burrow down so deeply in the soil that they’re unlikely to be affected by cold weather, Vafaie said. It’s been suggested by other entomologists, Vafaie said, that a colder winter may reduce the populations of mosquito species that carry West Nile virus during the following summer. What is known is that insects generally have several biological mechanisms for dealing with cold weather, even extremely frigid weather like large parts of Texas had in late December. Vafaie’s previous work under the supervision of Dr. Brent Sinclair, a prominent insect low-temperature biologist in Ontario, Canada, gave him a strong foundation and knowledge on insect cold tolerance, he said. Generally speaking, insects have three main strategies for dealing with the cold: freeze tolerance, freeze avoidance and migration, he said. He noted that though such insects are termed “freeze tolerant,” if they are taken from the field during the summer and placed in a freezer, they aren’t likely to survive. Other insects cannot tolerate freezing, but have other mechanisms to prevent ice formation in their cells, he said. The third strategy, migration, is also commonly used by some species of insects. 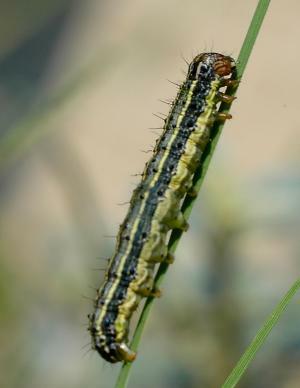 In East Texas, one of the most common examples of this strategy is the fall armyworm, he said. The fall armyworm is actually the larval form of a migrating moth, he said. Fall armyworm moths migrate in the millions northward from South Texas in the spring and summer. Upon arrival, each moth will deposit a clump of 50 or more eggs on individual blades of grass. When the eggs hatch, the larva quickly go on maneuvers en masse for food. They will move across pastures, devouring wide swathes of grass in their wake, like an advancing army, hence their name. Another migratory example is the monarch butterfly, Vafaie said. “Monarchs migrate to Mexico and Southern California every winter,” he said. One thing that may defeat many of these survival strategies, however, is when there are multiple incidences of very cold weather with warm temperatures in between. Such rollercoaster weather can decrease insect survival or reproductive potential, according to Vafaie. “It’s not that they don’t have strategies adapted to deal with frequent temperature variations; it just comes at a cost, for example survival or reproduction,” he said. But even when winter knocks back survival numbers, nature has a way of adjusting, Vafaie said. Two Minnesota state agencies are working on ways to make the environment healthier for bees. In a report to the Legislature on Wednesday, the state Department of Agriculture will detail its plan to review the use of a popular insecticide linked to bee deaths. Meanwhile, the state Department of Natural Resources is developing guidelines to improve the habitat for pollinating insects. The issue is also likely to be a hot topic during the upcoming Legislative session because pollinating insects are important to agriculture. In recent years, they have become victims of a perfect storm. There are fewer flowering plants on the landscape, which affects insect nutrition. Honey bees suffer from persistent disease problems. Another serious threat comes from the neonicotinoid insecticide. In the last several years, more than a third of the nation’s honey bee population has died each year, according to estimates from the U.S. Department of Agriculture. Protecting pollinating insects will be a daunting task, said University of Minnesota bee expert Marla Spivak, who is working with a new team of university scientists looking for answers. Spivak said a growing body of scientific evidence shows that pollinating insects are affected by low levels of insecticide. But scientists still aren’t sure how much insecticide bees are exposed to as they travel from plant to plant. The Legislature, which will consider funding some of the needed research, last year ordered the Minnesota Department of Agriculture to develop a process for reviewing the safety of widely used neonicotinoid insecticides, which are absorbed by plant roots, leaves and pollen. Neonicotinoid insecticides are used to protect Minnesota crops like corn, soybeans and sugar beets. They also are commonly used in urban settings and in greenhouse plants. State Agriculture Commissioner Dave Frederickson also ordered a regulatory review of the insecticides. A report due to the Legislature Wednesday will outline how the year-long review will proceed. “This has been such an issue, a contentious issue, that I just think it’s incumbent on the Department of Agriculture to take a very serious look at it,” Frederickson said. The review could lead to changes in how or when the insecticide is used. Frederickson says changes will be made only if the science strongly proves a risk to pollinators. Minnesota does have authority to impose regulations that are more restrictive than federal Environmental Protection Agency rules. Frederickson said neonicotinoids are safer for people than other types of insecticides. But he said the risk to beneficial insects can’t be ignored. DNR officials are developing guidelines for managing habitat to best provide food and protection for pollinating insects. Wildlife Habitat Program Manager Bob Welsh said new best management practices won’t bring major changes since the DNR already manages land to create diverse habitat. But it might mean changing when grassland is burned or mowed or adding more plants that are a good food source for pollinators. “There’s a lot that we don’t know about pollinators and we expect the BMP’s and restoration guidelines is going to be a living breathing document and change constantly as we learn new things,” he said. Any organization receiving state money to restore grasslands will also need to follow the new guidelines. There will be no requirements for farmers to improve pollinator habitat, but Frederickson said farmers should consider ways they can create pollinator refuges on their land. For Spivak, the guidelines are a good start. But she also wants to see financial incentives and enforcement to make sure the guidelines are followed statewide. Despite such challenges, Spivak sees growing public support for protecting pollinating insects. She said the grassroots organization Beez Kneez in Minneapolis wants to make public now-protected pesticide applicator records in the state. She said the group also plans to encourage homeowners to stop using insecticides. Lawmakers also are hearing about bees. State Representative Jean Wagenius, chair of the Environment, Natural Resources and Agriculture Finance committee, is surprised by the number of calls and conversations on the topic. The public will have a chance to comment on the two departments’ plans over the next few weeks. Minneapolis residents will kick off their healthy bee initiative with a public meeting Thursday night. In Lewis Carroll’s “Alice in Wonderland” a hookah-smoking caterpillar puffs out colorful words and boasts “a very good height,” at just 3 inches tall. Like something out of Alice in Wonderland, scientists have discovered a smoking caterpillar! View: Real-Life Smoking Caterpillar Uses Nicotine as Defense. “While this find may not push Alice’s hookah-smoking insect from its psychedelic pedestal, this caterpillar is pretty snazzy, as it can use nicotine to ward off hungry wolf spiders. Handling Your Pet After your new pet has had a day or so to settle in and check out its new surroundings, reach in and remove it gently from its nesting box. Do this during the day when it is sleepy and easier to handle. Put any other pets such as dogs, cats, ferrets, and large birds in another room because your glider might be frightened by their presence. 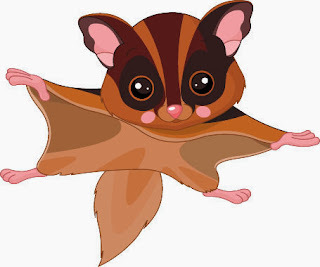 While it is not harmful to pick up gliders gently and briefly by lightly gripping the base of the tail, this should not be necessary with a tame one. Never pull on a glider’s tail in order to extract it from its nesting box or pull it from wire or objects to which it is clinging. I have heard some horror stories about tails that have come off in people’s hands. Pick your glider up bodily and hold it in your cupped hands or against your chest. If the glider resists being picked up by gripping objects in his cage, put your finger behind his clams and gently push them off of the object. Once your glider has settled down, you can place it in your pocket where it will probably go back to sleep. Put your hand in the pocket and stroke your pet occasionally so that it will get used to your scent and being touched. Eventually, the glider will find the nerve to come out and explore a little. Let it climb up onto your shoulder and check you out. Don’t be surprised if it wants to climb through your hair. You can read more on the care of Sugar Gliders in our Free Glider Guides listed on the Sugar Glider Store website!